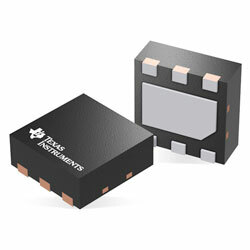 Texas Instruments TLV767 Precision Positive Voltage Linear Regulators are a wide input linear voltage regulator that maintains an input voltage range from 2.5V to 16V and up to 1A of load current. The output range is from 0.8V to 6.6V or up to 13.6V in the adjustable version. Also, the device provides a 1% output accuracy that can satisfy the demands of low voltage MCUs and processors. The device is intended to have a much lower IQ than traditional wide-VIN regulators, thus allowing the device to be well positioned to satisfy the requirements of increasingly stringent standby power demands. When disabled, the device draws only 1.5µA of IQ. The internal soft-start time and foldback current limit reduce inrush current through startup, therefore reducing input capacitance. Wide bandwidth PSRR performance is higher than 70dB at 1kHz and 46dB at 1MHz, which assists in attenuating the switching frequency of an upstream DC-DC converter and reduces post regulator filtering. To provide for more flexibility, the device has both fixed and adjustable versions. Typical appliances include TVs, monitors, and set top boxes; motor drive control boards; printers, PC peripherals, notebooks, motherboards; and Wifi access points and routers.